This book does a great job on this issue of men and church. He outlines the most basic factors that affect men. He discusses how they think and what appeals to them. David Murrow also outlines the history that has brought the church to its current form, which generally repels men. The only thing he misses, although bounces around, is the our Gospel understanding which is a the core of the problem David states “Again, there’s no need to alter the gospel, Jesus, doctrines, or core beliefs.” He writes about our gospel lacking self-sacrifice then misses it that the Gospel is call to risk….I’m not surprised since this main blind spot of the Church today. Murrow, David (2011-11-01). 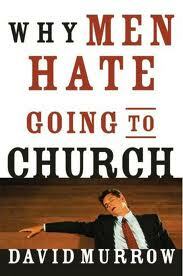 Why Men Hate Going to Church (Kindle Location 2317). Thomas Nelson. Kindle Edition.